The Little Whisk & Co: Accessory Wish List. Accessories are a key element to an outfit and with the aid of the my good old friend Google, I am going to share a few of my favourites that sit within a similar colour palette. So as you can probably tell from the collection below, the colour theme is grey, yellow and black. (neutral colours with a pop of colour!) I am honestly in love with all of these colours at the moment and think that they compliment each other nicely. Now I am definitely a handbag junkie and love collecting different styles and colours, but these days I try to be a little bit more careful when buying handbags. I don't like buying them for the sake of having a new one in my collection from you typical fashion store, I love to look more carefully in purchasing 'better quality' and unique styles. The mini Zara office bag is perfect for your main handbag essentials, which is similar to the neutral coloured bag in the bottom right hand corner. Sometimes a big bag and weigh you down when you are constantly walking around, so it is nice to switch it up. I definitely prefer medium to smaller sized bags, but would rather have a large bag for long distance travelling, road trips or for studying. I am off on a little Melbourne adventure at the end of the year as a celebration of finishing 13-years of schooling with my older sister and friend. It is really not that far from where I live a good 2 hours maximum on a plane, but I am a lover of the airport atmosphere and the feeling of travelling to a new destination. I also love people watching to see what they are wearing and thinking of where they are going. (Not in a creepy way, might I add!) So, I thought I would try to find myself a nice travel wallet that I can not only use for my tickets, but as an everyday wallet. I plan on travelling a lot more with the next few years and finding one would be perfect. I have found this stunning print from Kate Hill and of course it is yellow and grey! You know that by luck you will buy one and within the next couple weeks you will see one that you love even more, but you really you won't be holding onto the same one for years - right? Floppy hats are so sophisticated and I love hats that have a wide brim and well I won't go listing off the features, because the two hats below are exact hat that I love. Polka Dots is my favourite print as I am sure many of you would already know by now, and this gorgeous backpack is an essential in anyones collection for day trips, university or just a simple accessory. - This shop (Metal Bar Neutral Bag) has a stunning collection of handbags and jewellery that I recommend you all check it out. I hope you have enjoyed this post and I think that I will be making some of these purchases in the near future! 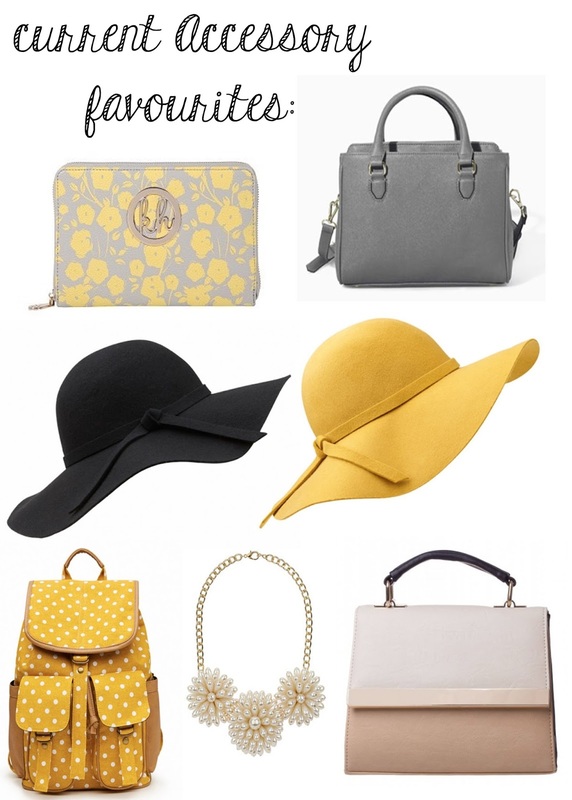 wow, I never really thought about how grey + mustardy yellow looks amazing together until now! I know it amazed me to and now I can't stop finding items with those colours!